Your project can be anything from cards, to treats, to scrapbook pages etc! You must use only Jaded Blossom stamps & dies on your project. 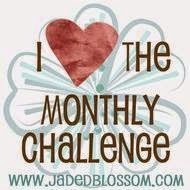 You must link up at Jaded Blossom's Blog by September 3, HERE. Too cute!! Love that he is purple!! awe such a cute dinosaur !!! love the purple of course !